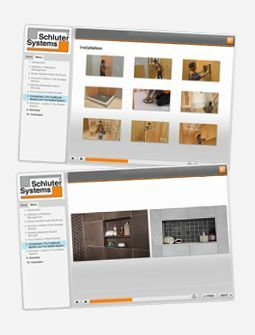 Is it required to waterproof Schluter®-DITRA-HEAT? Waterproofing the floor is not required, but can be beneficial in some cases. Today’s construction methods, which include the use of lightweight, moisture-sensitive materials, such as plywood, OSB, and gypsum concrete, have made the installation of hard surface coverings particularly challenging. If wood or gypsum concrete substrates are exposed to moisture, the tile layer above can be damaged as a result. Typical areas that require waterproofing include tub surrounds and showers. However, there are other commonly tiled areas that may, through unexpected circumstances, become exposed to significant amounts of water; for example, an overflowed toilet, or ruptured dishwasher, icemaker, or washing machine lines, which can result in flooding. Waterproofing these floors can save an owner from replacing the tile assembly and substructure in the event of a leak. DITRA-HEAT installations can be made waterproof with minimal effort. Since the matting is made of waterproof polypropylene, the only extra step necessary is to seal the seams and floor/wall connections. This is easily accomplished by applying KERDI-BAND to these areas using Schluter SET™, ALL-SET™, FAST-SET™ or an unmodified thin-set mortar. The result is a waterproof installation that will not suffer damage in the event of an unexpected water leak. KERDI-DRAIN or KERDI-LINE may be used to provide drainage in DITRA-HEAT installations. If installing the Schluter-DITRA-HEAT inside a shower, we require that the entire installation be covered using the Schluter-KERDI. For DITRA-HEAT waterproofing information, see detail DH-WP in the DITRA-HEAT Installation Handbook.